Domestic demand for cars continued to plunge last month as the number of models built for the UK fell by 35 per cent, new industry figures show. 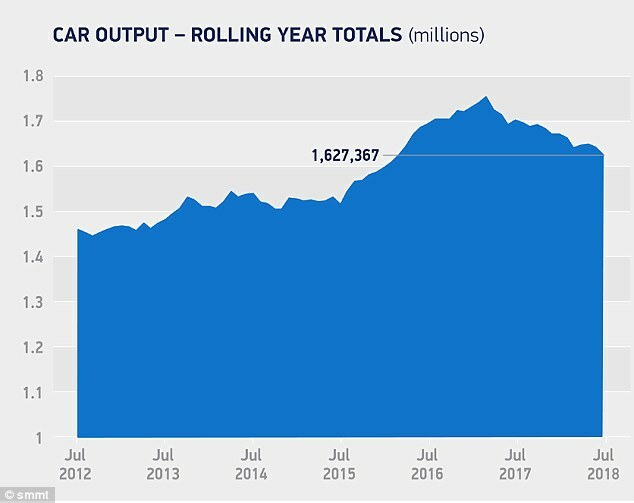 A total of 121,051 cars left production lines in July, which is nearly 15,000 fewer models, or an 11 per cent decline, compared to the same month last year, according to the Society of Motor Manufacturers and Traders. The biggest decline was in the number of models built to be sold in the UK, which fell from 29,872 in July 2017 to 19,414 last month – a 35 per cent decline. It follows a 47 per cent fall in June. 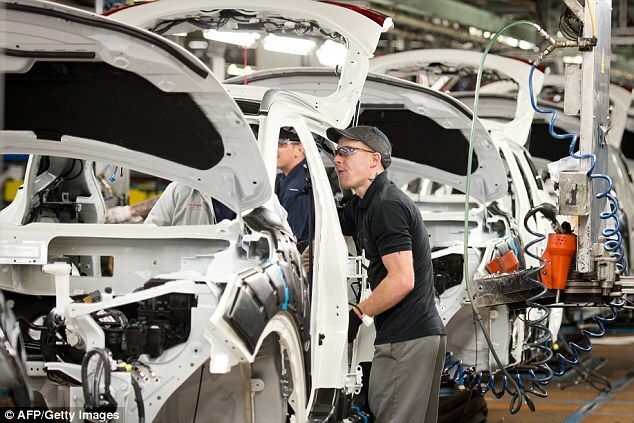 Cars manufactured for export – which remains the biggest market with about eight in ten cars produced in the UK being sold abroad – fell by a much smaller 4.2 per cent to 101,637. But this follows a 6 per cent increase in June. And it’s problematic in light of looming Brexit as the EU is Britain’s biggest trading partner, accounting for 53 per cent of cars produced for export. The SMMT played down July’s overall decline and blamed ‘a raft of factors’ for the fall in output, including model changes, seasonal and operational adjustments and preparation for the introduction of new emissions standards. ‘While the industry is undoubtedly feeling the effects of recent uncertainty in the domestic market, drawing long term conclusions from monthly snapshots requires a health warning,’ said SMMT chief executive Mike Hawes. The SMMT said the sector was on track to meet its 2018 expectations, with 955,453 cars built in the first seven months of the year. While production for the UK is currently down 16 per cent compared with the same period last year, exports dipped by a smaller 1.2 per cent. Unite’s assistant general secretary Tony Burke said: ‘Today’s car figures once again underline the critical need for Theresa May to avoid a cliff-edge Brexit. ‘The UK’s car workers and those in the supply chain have worked tirelessly to make Britain’s car industry a global leader. Stuart Apperley, head of UK Automotive at Lloyds Bank Commercial Banking, said: ‘While consumer confidence has been rising in the EU, elsewhere motorists need a lot more encouragement to invest in a new car amid so much uncertainty. ‘Even the usual spike in output as factories ramp up production ahead of summers shutdowns wasn’t enough to outweigh the fact that governments in a number of our export markets appear reluctant to give modern diesel engines the vote of confidence they deserve.